Devil in the detail continues to examine the Netflix Daredevil series episode by episode, picking out moments that might have slipped by in the midst of binge watching. The Kingpin: Lover, raconteur, man about town. Wilson Fisk, we meet at last. And it turns out you're quite the Romeo. Here is a man that woos art dealer Vanessa, albeit clumsily. He asks her out but she fends him off with a need to stay at work, he walks away but she interrupts by asking is that it? She then tells of how another man offered to buy everything in the gallery. His response of "A woman that can be bought isn't worth having" doesn't seem like a winning chat-up line - that word having lingers ominously - but somehow it works, and soon he and Vanessa are living it up at an Italian restaurant, chatting about fine living and Hell's Kitchen, until a sour-tasting Russian dessert in the form of an interrupting mobster ruins the date, scares off Vanessa and leaves sourpuss Fisk beating the man to death with a car door. A romcom this ain't. Now I hesitate a little to say this as it's only four episodes in but the female characters aren't doing too well in this show so far. We have Karen Page - a damsel in distress in the first episode, and here we have references to a shady past and again needing to be saved, this time by Ben Urich, from getting out of her depth in an investigation. There's Claire Temple, who this episode is beaten and bloodied by Russian mobsters being hunted by Daredevil. And there's Vanessa, who so far is portrayed as nothing more than an object of desire (and perhaps redemption) for the Kingpin. Karen Page is the most developed character of those so far, but there's a way to go yet before she will feel fully-formed. Meanwhile, the violence against Claire Temple this episode edges dangerously close to fridging territory. I hope that future episodes will do more to stop female characters being regarded as victims or trophies. Continuing the theme of previous episodes, the violence of the show is shocking - both that perpetrated against Claire and, more pointedly, the way in which the Kingpin wreaks his revenge on the Russian mobster at the end of the show, slamming a car door over and over and over on his head. It works completely on the tone of the show but hey, viewer beware. After three episodes of build-up towards meeting Fisk, this episode neatly undercut the fear others feel for him, before brutally re-establishing that in the closing moments. - Karen's talking-to for Ben Urich has stirred up his journalistic pride. He's on the case and not to be derailed. 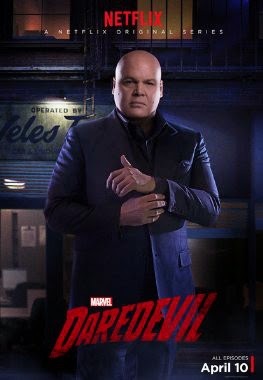 - Mr Fisk needs a new suit. He mentions to get "Potter" to make one. That may be Melvin Potter, Marvel's tailor to the underworld, sometimes known as the Gladiator. Yes, he makes costumes for bad guys.